Tom led me to his and Janet’s log home, where they’ve opened a tasting room in the lower level, with a walkout patio overlooking the vineyard. I was invited to take a seat at one of the wine barrel tables, where I would begin my wine tasting. Out came perfectly chilled wine, along with generous plates of cheese, crackers, and grapes. Frontenac Gris & Pinot Gris: An easy-drinking wine that goes well with curry and other hot foods. Frontenac Gris & Unoaked Chardonnay sur Lie: A totally delicious wine (can you tell I’m not a sommelier with my descriptions?) My husband just loved it. Barrel Fermented Chardonnay: Much richer than the other wines; perfect for walking through the vineyard, as I did while getting a tour (more on this in a moment). Marquette & Shiraz: Very peppery, which I adore! All wines are priced from $13-17. I’m no wine connoisseur (even though I drink a lot of wine! ), but these wines were easily comparable to other Ontario wines that cost $25 or $30 per bottle. So how is it that a little winery in Ottawa is producing such great wine? Well it helps when you’ve been making wine since you were 14, in one of the top wine-making regions of the world. Tom Moul grew up in South Africa, where he spent his teenage years making wine from various fruits, such as mulberries. When he was older, his professional career brought him to business meetings throughout South Africa, where he’d use his free time to visit wineries. Tom would ask for some of their grapes to bring home, which he would use to make his own wine and collaborate with the winemakers on how they developed their wine. This collaborative approach has served Tom well. 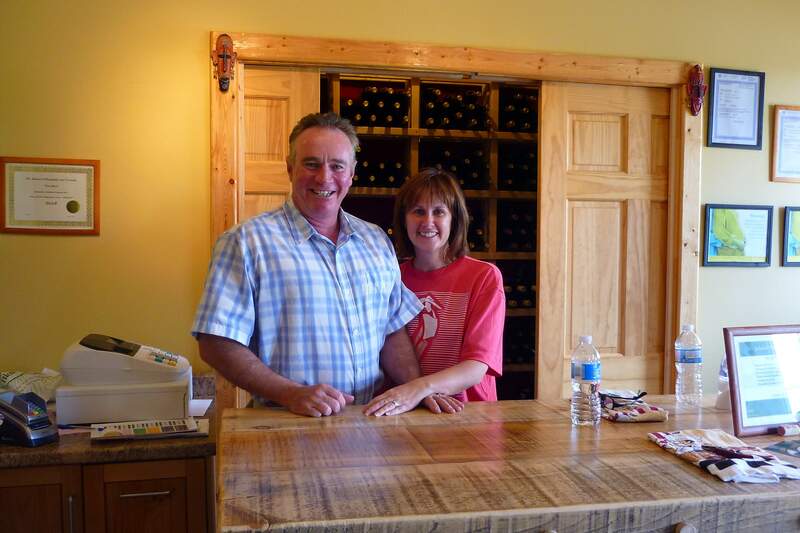 He seems to have no shortage of people who want to help him succeed with his business, from local and Niagara vintners who provide advice and feedback on his winemaking, to the friends and family who turn out for planting parties and harvests. This cooperative spirit is also apparent in Tom’s approach to education: he’s enrolled in the Algonquin College Sommelier Program, but has also been a guest speaker in the program where he provided hands-on vineyard experience to students. Visitors are welcome to tour the vineyard and property on their own, although if Tom or Janet is available, they can give you a tour. Either way, a stroll through the 38-acre property is very enjoyable and well worth the time. You can purchase a glass of wine to take with you ($5-6 per glass). Your first stop should be the 11 acres of vines, where you can see several grape varieties and observe the different stages of growth (the oldest vines were planted in 2007). The Mouls try to follow organic processes with their vineyard, using insecticidal soap for pest control, and sheep manure for fertilizer. So far they have not needed to irrigate the vines. After touring the vineyard, you can follow the “country walk”, which runs along the hay fields, then along the Jock River, and back to a man-made pond with a waterfall. The pond is used as part of the log home’s geothermal heating and cooling system. As you’re walking the trail, look for the carved “faces” on some trees! The property also has an old orchard dating back at least 100 years. The Mouls are planning to experiment with making some cider from the apple trees. Other new product ideas include ice wine, strawberry chardonnay, and several more varieties of wine. As if running a vineyard and winery were not enough, both Tom and Janet work four days a week in the IT industry. That’s why the winery is open only from Friday to Sunday (11am to 6pm). Perhaps this is a good thing, because Jabulani is still a very small winery and has only 6000 bottles to sell for the season. Tom is hoping that they don’t sell out until later in the year, so that all visitors can have the opportunity to buy their wine. Considering that many visitors buy a whole case (including myself), it’s probably a good idea to get out there sooner than later if you want to discover how good their wine is. Jabulani is open on weekends only until Labour Day. After that, they are open by appointment only. Their wines are not available at the LCBO, so you’ll need to visit the winery if you want to purchase a bottle. Or if you’re looking to make a weekend out of touring local wineries, have a look at my article about Wineries in the Ottawa Region.